Bat populations in some places in North America appear to have developed resistance to the deadly fungal disease known as white-nose syndrome. Researchers from UC Santa Cruz analyzed infection data and population trends of the little brown bat in the eastern United States and found that populations in New York that had stabilized after initial declines had much lower infection levels at the end of winter than populations that were still declining. The little brown bat was previously one of the most abundant bat species in the eastern United States, but was reduced to less than 10 percent of its former population with the arrival of white-nose syndrome. The fungus was introduced to New York State in 2006, and it continues to spread in the United States and Canada, causing declines of 90 percent or more in several species. 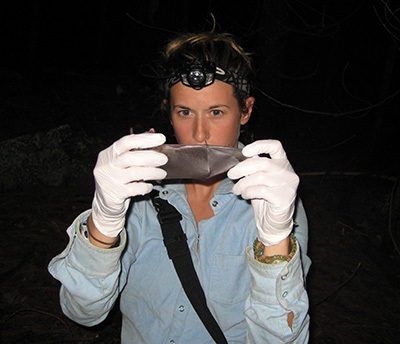 UC Santa Cruz researchers led by biologists Marm Kilpatrick and Winifred Frick have been at the forefront of research on the disease, conducting field surveys to help track its spread and studying the dynamics of disease transmission and the impacts on bat populations. In the new study, researchers sampled hibernating bats at nine sites in New York, Illinois, and Virginia, using a standardized sampling technique to detect and quantify the amount of fungus on each bat. They then used mathematical modeling techniques to examine differences in disease dynamics between persisting and declining populations. Their findings were published December 5 in the journal Philosophical Transactions of the Royal Society: Biological Sciences. The researchers considered several possible hypotheses for the ability of some bats to persist with the fungus: host resistance, host tolerance, and lower transmission. Their results pointed toward host resistance causing lower growth rates of the fungus during late winter. The results did not support the other hypotheses, Langwig said. The mechanism underlying the resistance of little brown bats remains unknown. “It could be changes in arousal behavior, differences in skin microbes, or an activation of the immune response by bats after infection has reached a moderate level. Future studies are needed to uncover these details,” Langwig said. In addition to Langwig, the coauthors of the paper include Winifred Frick and Marm Kilpatrick, both faculty members in the Department of Ecology and Evolutionary Biology at UC Santa Cruz; Joseph Hoyt, a graduate student at UC Santa Cruz; and Katy Parise and Jeffrey Foster at the University of New Hampshire. This work was supported by the National Science Foundation, the Woodtiger Fund, and Bat Conservation International.